… no pun intended, and many people know the very real discomfort associated with heartburn. There are a few terms associated with heartburn that people like to use interchangeably (Acid Reflux & GERD), but we are on a mission to change this. Let’s take a look at those terms and definitions real fast before we continue. Heartburn: The symptom of acid reflux. It is caused by acid splashing up into the esophagus from the stomach. Acid Reflux: The act of acid splashing up from the stomach that causes the symptom of heartburn. 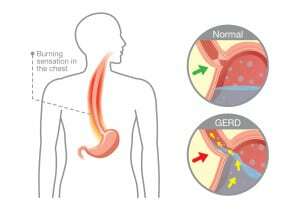 GERD: Gerd (gastroesophageal reflux disease) is a severe and chronic reflux on steroids. This disorder can lead to some very scary complications… cancer being one of them. Now that we have the terminology out of the way, we can explore some ways of preventing GERD and Acid Reflux (thus preventing heartburn). 1. Lose weight: Extra stomach fat causes pressure that pushes acids up to your esophagus. If you are suffering from chronic acid reflux and are overweight, then this might fix the disorder entirely. 2. Avoid problem foods: Some foods should be avoided if you are at risk for GERD. Fatty food, spicy foods, and caffeine are three of the most common things to avoid to help prevent further problems. 3. Quit smoking and cut back on drinking: This may seem like a default for every health-related countdown, but there is actually some science behind it. Nicotine can mess with your saliva’s ability to cleanse acid from the esophagus. Alcohol can cause muscle spasm that assist in promoting GERD. 4. Eating correct foods: Some foods provide qualities that help with reflux symptoms. Foods like oatmeal and ginger have qualities that help prevent reflux, whereas Bananas, various melons, and salads are encouraged in a diet because they are not common triggers of GERD. 5. Standing: Well this is a strange tip isn’t it? Have you ever heard to not eat right before you go to bed? Lying down after eating does not allow for gravity to help drain food and stomach acids where it needs to go… your stomach. Just remember that gravity can be your friend in fighting heartburn. If you believe you are suffering from GERD, then you need to see your local ENT for solutions. Contact Us today for a solution to your Acid reflux and GERD problems.